After being awe-inspired by his work for years as I flipped through the pages of Backpacker magazine and a broad variety of other outdoor magazines and then becoming “e-friends” some time ago, I finally had the chance to meet outdoor photographer extraordinaire, Bret Edge (www.bretedge.com), on our short jaunt through Arches and Canyonlands national parks en route to Montana this past December. In an all-too-short chat filled with lots of laughs, I quickly learned that he too was a Corporate-America-escapee passionately following his dream, he too has lived in Arizona, and even better, he too dislikes clear blue skies! AWESOME! 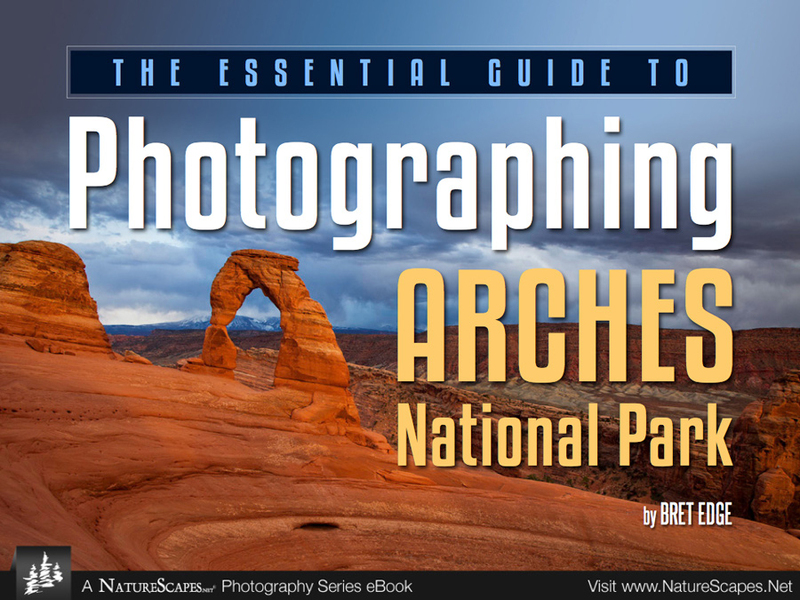 If you’re looking for a super easy-to-read, to-the-point, handy reference guide to photographing Arches National Park, then look no further than this eBook! Those who have never set foot in Arches before will be pleased to find upfront an excellent overview of all the pertinent details to ensure an enjoyable visit here, including an introduction to the park fees, wildflower and fall color seasons, and safety concerns. After thumbing through the clear introduction, the light-chaser in me thoroughly enjoyed how Bret conveniently divided the 19 featured locations into three sections according to the light: Sunrise, Sunset, and Alternative. With this type of no-nonsense organization, planning your next photographic trip to Arches would be a breeze! Each location features a short description, trail length, elevation gain, trail head GPS coordinates, trail head elevation, and hiking difficulty. In addition, he also shares very clear written directions to the trail head, concise photography advice in clear-as-blue-sky-day bullet points, and additional insightful location-specific details under the “Need to Know” section. I appreciated the “411” on classic spots such as Delicate Arch and Balanced Rock, but was particularly keen about his inclusion of several lesser known locations like Courthouse Wash and Marching Men. For inspiration and to aid in your visualization, each location features at least one, if not two of Bret’s inspirational images. In other words, in this 31-page (horizontal spread), you have everything you need to know to get you in the right place at the right time for your photographic outing to Arches in the palm of your hand. My only beef? I wish the photographs for each location were bigger! It sounds like a lame nit-pick in an otherwise perfect eBook – and indeed, it totally is! – but Bret’s photography is so striking, I wish each location showcased all his photography work in huge two-page spreads! OK, OK, a coffee table book it’s not – nor was it ever intended to be – but one thing is for sure, his included photographs will surely inspire you to get yourself to Arches sooner rather than later. If you’re planning a trip to Arches this year, do yourself a favor and pick up this eBook before you go for a mere $14.95 at Naturescapes.net: www.naturescapes.net/store/the-essential-guide-to-photographing-arches-national-park-ebook-by-bret-edge.html. If you’d like to get a glimpse of Bret’s writing style and the type of content he included in his eBook, visit his Courthouse Wash sample posted on the Naturescapes.net website at www.naturescapes.net/articles/travel/photographing-arches-national-park-courthouse-wash.
And when you decide to see this spectacular southwestern park yourself, be sure to poke your head into Bret’s gallery – “The Edge Gallery” at 137 N. Main Street in Moab, Utah – to say HELLO! This classy place featuring Bret’s stunning photography is open every day except Tuesday and Wednesdays from 9 am to 9 pm on the weekdays, 9 am to 10 pm on Saturday, and 9 am to 6 pm on Sunday. If you’d like an expert guide to show you around the area, Bret leads private workshops not only around Arches, but also though nearby Canyonlands National Park as well. Read more about his workshops and see his work on his website at www.bretedge.com.